Kitesurfing/ Kiteboarding and Stand Up Paddleboarding, – Paddlesurfing (SUP) are the world’s fastest growing wind and water sports. They are easy to learn+ heaps of fun. If you want to have a go then you have come to the right place!! Kitescool started in 2003 and since than has taught thousands of keen people how to kitesurf. It´s a fantastic sport, using the wind and kites in combination with small boards to surf the water, do big jumps and fun tricks. Kitescool is a mobile Kitesurfing school and we are lucky to teach mostly at Tahunanui Beach, Nelson, New Zealand’ s premier kitesurfing beach! and also teach at Marahau Beach in the Abel Tasman National Park – one of the worlds most beautiful Kitesurfing spots. Stand Up Paddleboarding works in perfect combination with Kitesurfing and is lots of fun. SUP is an exciting way to explore the water and beaches, even catch some waves. It´s a fun work-out! Mornings are generally ideal conditions for it and afternoons when the wind picks up we are blessed with perfect kitesurfing conditions. Kitesurfing + SUP courses/lessons – easy to learn and heaps of fun! 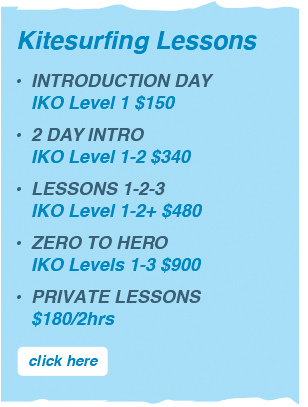 Click here for information on our kitesurf courses – run by IKO qualified instructors. We are very passionate about what we do and run professional and fun lessons and courses, hire, repair and sell all equipment. All our Kitesurf Instructors are IKO, BKSA or VDWS qualified and offer lessons to suit all levels. During your lessons we provide all the equipment, you will just have to come along and enjoy the thrill of Kitesurfing or Stand Up Paddleboarding! Kitescool is the only SUP school in the Nelson region that uses Accredited SUP instructors! Kiteboarding in the Nelson Region – absolute freedom, exhilarating speeds, huge air and unreal freestyle moves. To visit Nelson is to discover blue skies, golden sand beaches, pristine lakes, three spectacular national parks, unique landforms, vineyards and gourmet cafes, artists and galleries, boutique shopping experiences and a uniquely relaxed Nelson way of life. Nelson region combines the finest elements of the New Zealand experience and is blessed by having the most sunshine hours in New Zealand.